It’s not chemistry between Tinka Foster and Sam Anderson that made them agree to fake date. With her parents trying to set her up with an annoying student golf coach, and intentionally single Sam’s family pressuring him to bring a date to his brother’s wedding, they could both use a drama-free summer. So it’s not his muscular arms and quick wit that makes Tinka suggest they tell everyone they’re both taken. Definitely not. And it’s not butterflies that makes a kiss for appearances during the lake party go on way too long—so long that Sam wishes it were real. But Tinka keeps people at arm’s length—she’s always been second best, even to her parents. And her relationship-for-show could crush everything when she realizes she’s done with fake, pretend, and second-best. Disclaimer: This Entangled Teen Crush book contains bikinis at the lake, a lot of making out in dark theaters, and a meet-cute you’ll read twice. 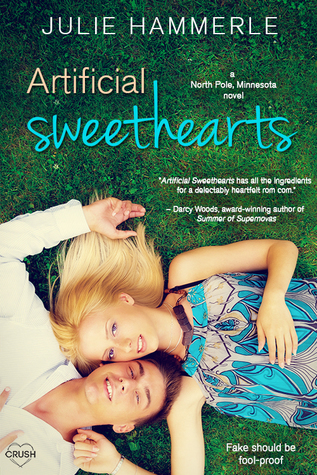 Julie Hammerle is the author of The Sound of Us (Entangled TEEN, 2016) and the North Pole, Minnesota young adult romance series (Entangled Crush, 2017). She writes about TV and pop culture for the ChicagoNow blog, Hammervision, and lives in Chicago with her family. She enjoys reading, cooking, and watching all the television. Ready to flee at any moment, she perched next to Jane on the bench, where the hot, sticky varnish stuck to her legs immediately. Tinka unscrewed the cap, which gave off the familiar rip-pop sound that proved the bottle had not been tampered with. Tinka tilted it back; and as the cold water coated her parched throat, she forgot for a moment she was about to be murdered. “This is a gorgeous house,” Jane said. “My father owns the house. I’m Sam. Anderson,” he added for good measure. “I live here.” He gestured toward the back door. “He has no way about anything. No offense.” Tinka nodded to Sam. “None taken.” Knitting his brow, Sam lifted his hat and ran his fingers through his curly brown hair. He had hazel eyes with friendly crinkles on the corners that didn’t disappear even when he frowned.